A digital image sensor is a grid of small light-sensing elements called picture elements, or pixels. Each pixel is typically a few microns wide. A micron is a millionth of a meter. Figure 2 shows the structure of a single pixel. The pixel's detector (shown in blue) is generally made of silicon and is "sensitive" to light. When light strikes the pixel, some of its energy is transferred to the electrons inside the silicon atoms. If the energy is high enough, the electrons dislodge from their parent atoms. This is called the photoelectric effect . The freed electrons are collected in a bucket-like region known as the potential well. The number of freed electrons − the amount of charge that builds up in the potential well − directly depends on how much light falls on the pixel. The stronger the light, the more electrons are freed. Therefore, the voltage in the potential well is a measure of the image brightness at that pixel. Bigshot uses a type of image sensor called Complementary Metal Oxide Semiconductor (CMOS, pronounced "see-moss"). In CMOS sensors, each pixel has its own circuitry for measuring the voltage of its potential well . As seen in Figure 2, the circuit takes up precious real estate on each pixel which could otherwise be used by the light sensitive detector. 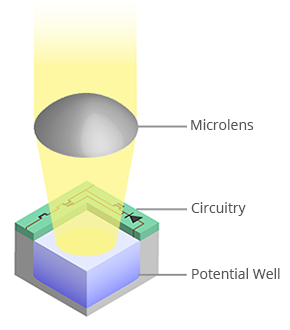 To address this problem, each pixel is equipped with a microlens (a tiny lens) that focuses the incoming light away from the circuitry and onto the detector. Thus, each pixel is able to capture all the light focused by the imaging lens onto it. "The Photoelectric Effect". ScienceTrek. [Online] Available: http://www.colorado.edu/physics/2000/quantumzone/photoelectric.html. Litwiller, D. CCD vs. CMOS: Facts and Fiction, Photonics Spectra, January 2001.